One woman's trash is another woman's treasure. 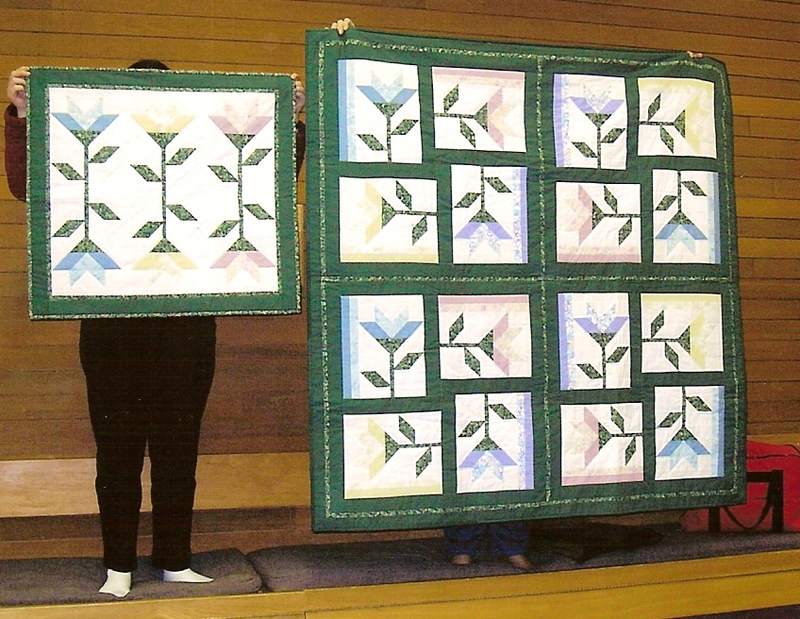 This quilt was initially a UFO that was donated to our Guild. It came in a ziploc bag that contained individual blocks (some finished, some still in pieces), background fabric and sashing. I thought I'd take up the challenge of finishing it. Our Guild was attempting to reach a specific number of donation quilts for the year and this would be a welcome addition. There were sufficient patches and partial blocks to complete a lap quilt and a table topper. Perfect for a senior's room at the local care home. The setting for the lap quilt was determined by the partially completed quadrant that came in the original ziploc bag. It is difficult to see in the photo, but the flowers of the lilies are pastels; blue, pink; violet; and yellow. 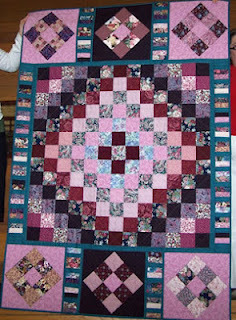 Here is another quilt made from fabric donated to our Guild. This time the package contained strips and squares. As you can see there were enough squares to create a Trip Around the World, but it was too small as a lap quilt. Solution? Use the remaining squares for 6 nine-patch blocks for the top and bottom. There still remained some areas that needed filling so it would all fit together. I used up the last of the squares by cutting them into strips to create piano key spacers. Ta Da!! 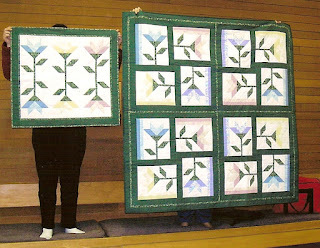 one lap quilt. I think these projects are wonderful. I particularly like the trip around the world solution. It makes it fun and unique. Well done. I love the carolina lily blocks. You and your guild do such wonderful aid work.